A Secret Mission, A Brave Father, and a Young Son’s Prayers. The Roy Anderson is about to make the worst decision of his life and leave his family for selfish reasons on Thanksgiving day, 2001. But, thanks to the prayers of his son, an angel sends Roy back in time to 1941 with no memories. There, he will experience the true meaning of family, sacrifice, love, and commitment when he is taken in at the Collinsworth boarding house. For a U. S. Army Corps pilot, Frank Collinsworth, has not been heard from since the attack on Pearl Harbor and the family waits anxiously to see if he will return home by Christmas. Daniel, the younger Collinsworth, must decide if he will have to become the man of the house while everyone prays around the Homecoming Christmas Tree for his father’s return. Will Roy revert to the ruthless businessman he has become, or will his time spent with the Collinsworth family give him a second chance? Jonathan Steel’s partner, Theo King, has been kidnapped. In his pursuit of the kidnappers, Steel discovers a conspiracy by a wealthy media mogul to go back in time to the last days of the life of Jesus of Nazareth. All leads converge on ancient Jerusalem on the eve of the crucifixion. Steel teams up with a policeman on a similar mission, Jason Birdsong to try and rescue the media team who are now stranded in the past. Or, are they? What is real and what is staged? Find out when Steel confronts the real power behind the scene, the 9th Demon and his plan to alter the history of civilization. The monsters aren’t under the bed; they are inside of us! On the eve of the unveiling of his latest dinosaur discovery, Dr. Wallace Darwyn is murdered by his religious associate Dr. Frank Miller. Ruth Martinez, an up and rising attorney, is given the impossible task of defending a man caught red handed. With the help of the mysterious Jonathan Steel, Ruth must overcome her rival, Bryan Nicholas in the courtroom while looking for the real murderer. And, in the process, she faces a deadly creature who truly lives out the principle that nature is “red in tooth and claw”. BARNES & NOBLE PRINT: This link. BARNES & NOBLE NOOK: This link. EVIL REIGNS FROM THE SKIES! The forces of evil now dominate the heavens with the arrival of the Tenth Demon and his army of extraterrestrials. Determined to locate a secret cadre of enhanced human children, the demon and his human host must fact Jonathan Steel and his team. As a mysterious person surfaces from the past to complicate matters, Steel must locate and rescue the Children of the Bloodstone before the Tenth demon rains destruction down upon the Earth. Join Jonathan Steel in his battle against evil forces from beyond our planet in the final showdown where Earth’s survival hangs in the balance. As well as another world! JONATHAN STEEL, A DEMON HUNTER BY TRADE, MUST ONCE AGAIN FACE A SUPERNATURAL FOE AS A NEW, EVIL CULT RISES FROM THE DARKNESS AND THREATENS TO ENGULF THE WORLD IN CHAOS. Jonathan Steel is a demon hunter by trade, taking out demons with revenge as his motivator. The demons have taken away people he has loved, including the one woman who could have revealed his past to him. He has already defeated two demons, but he knows there are eleven more out there. If he does not go after them, they will come for him. Now saddled with protecting both his new partner and his mentor’s nephew, Steel returns to Louisiana, where he must move into a house full of horrifying memories. Meanwhile, Vivian Darbonne, a powerful demon who just lost her husband to Steel, embarks on a desperate search for a mysterious artifact called the Ark of the Demon Rose— just as a new evil cult rises from the darkness and threatens to engulf the world in chaos. As seats of power are covertly altered within the government, Steel knows that in order to defeat the cult, he must first find an ancient chest that holds the secret to defeating the eleventh demon and, most importantly, power over the Council of Darkness. In this third installment of the Jonathan Steel Chronicles, Jonathan Steel and his colleagues once again must attempt to stop a demonic foe before chaos is unleashed on the world! Jonathan Steel is a man with no past who is destined to spend his future hunting down the most powerful demons on earth. Following the defeat of the thirteenth demon, Vivian Ketrick has plans to take control of his now-open territory. But another—and much more powerful—entity has arrived from Europe to challenge her claim. Rudolph Wulf has genetically engineered his blood to carry “vampire magick,” and he is using it to recruit an army of vampires and werewolves the likes of which the world has never seen. Raven, an assassin from Steel’s past, has also surfaced. Hired by Ketrick, she has dark plans of her own and could hold the key to Steel’s lost past. As the forces of darkness converge for battle, Steel is caught between his desire to regain his memories and his mission to save the lives of those he cares about most. Fast-paced and thrilling, The Twelfth Demon, Mark of the Wolf Dragon stretches from the slums of the big city to the shadowy world of Transylvania to explore the legend and lore of vampires and the power of cults to control lives. Jonathan Steel is a man without a past in search of the evil creature that has destroyed the only goodness in his life. He must come to grips with his violent nature in order to help those around him who are oppressed by the evil in their lives. In helping these people, he hopes to find his evil nemesis, the 13th demon. He arrives in the small town of Lakeside to help Reverend Thomas Parker eliminate an macabre presence taking over his church. Steel soon discovers this evil is only the tip of the iceberg when he meets Robert Ketrick, a ruthless businessman determined to own the entire town. Steel puts together a team of experts to decipher the mysterious writings in the church and soon discovers that the creature taking residence in the building has ties to the 13th demon. 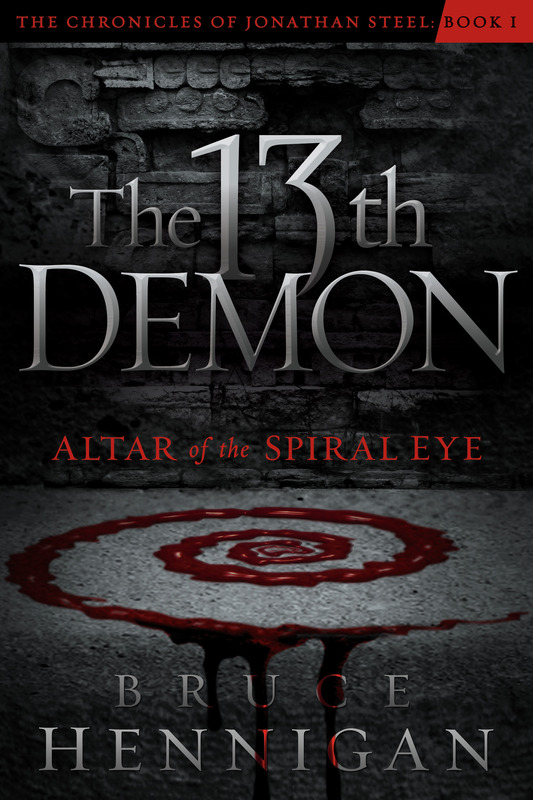 As he races to protect those around him from this growing evil and the plans of Ketrick, he must decide on his true desire: to exact revenge on the 13th demon or to help those people around him in danger. As the story builds to an explosive climax, Jonathan Steel learns a disturbing secret about his past and discovers that the 13th demon is on the first in a long line of arcane creatures he must now face if he is to learn his own identity. Barnes & Noble link clickhere.